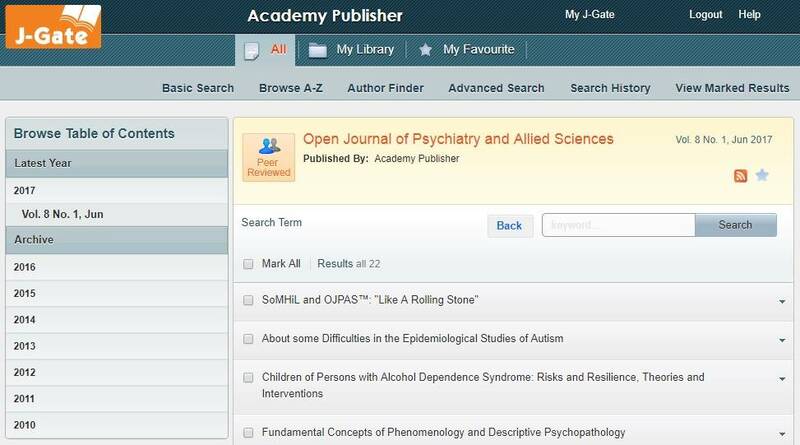 The Open Journal of Psychiatry & Allied Sciences (OJPAS®) is a peer-reviewed biannual academic journal. New ideas come from fresh minds before they are bogged down by conventional thinking. In the journal, we plan to tap those materials, ideas, and discussions. A long felt need of present day psychiatry is to understand the cultural influence on symptoms, management, and most importantly, on prevention of mental illnesses. This can be undertaken only by reporting and analysing the cases in that cultural rubrick. The journal aims to be the platform for discussions towards the same. It publishes editorial, review article, original article, case study, commentary, and letter to editor in the fields of psychiatry, psychiatric nursing, psychiatric social work, clinical psychology, allied behavioural and medical sciences. 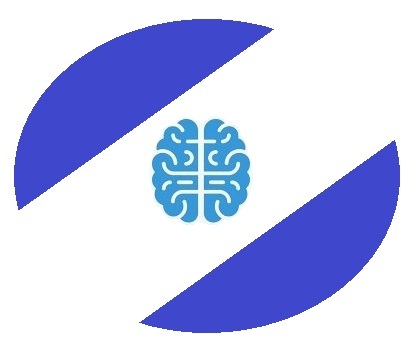 In addition, OJPAS® also aims bring the psychiatric research from Low And Middle Income Countries (LAMIC) as well as LAMIC-related psychiatric issues to global platform. In other words, indexation of scientific literature related to psychiatry from LAMIC in major bibliographic databases globally. The journal publishes rare/unique psychiatry cases in LAMIC, LAMIC-related topics like problems faced/unaddressed issues of psychiatry, along with research reports containing data from LAMIC. It aims at formation of a global consortium for research and exchange of clinical dialogues on psychiatry and allied health sciences with an attempt to bridge the LAMIC-non LAMIC gap. OJPAS® is Open Access Journal. The journal adheres to the Budapest Open Access Initiative (BOAI) definition of open access: that users have the right to "read, download, copy, distribute, print, search, or link to the full texts of these articles". The journal offers 'Platinum' open access model. Platinum open access model means that there is no Article Processing Charge (APC), also known as publication fee, charged to authors and articles are immediately available on the journal website once published. Moreover, the journal allows the author(s) to hold the copyright and to retain publishing rights without restrictions. OJPAS® follows the International Committee of Medical Journal Editors (ICMJE) Recommendations (Journals Following the ICMJE Recommendations). 1. An author submits a manuscript. The manuscript will go through plagiarism check in the free online plagiarism checker tool (Dupli Checker) and using Google. 2. The editor reviews the manuscript and makes an initial decision based on manuscript quality and editorial priorities, usually either to send the manuscript to peer reviewers or to reject the manuscript at that point so that the author can submit it to another journal. 3. For those manuscripts sent to peer reviewers, the editor assigns reviewers to the manuscript. 4. Double blind peer review process is followed. 5. The reviewers review the manuscript. 6. When required, papers may be assigned to statisticians as well to check the correctness of statistical data and analysis. 7. The editor makes a final decision based on editorial priorities, manuscript quality, reviewer recommendations and perhaps discussions with fellow editors. 8. The decision letter is sent to the author. 9. The accepted article will be published online after receipt of the corrected proof and the disclosure of potential conflicts of interest form (the ICMJE Conflicts of Interest form available from: http://www.icmje.org/conflicts-of-interest/). 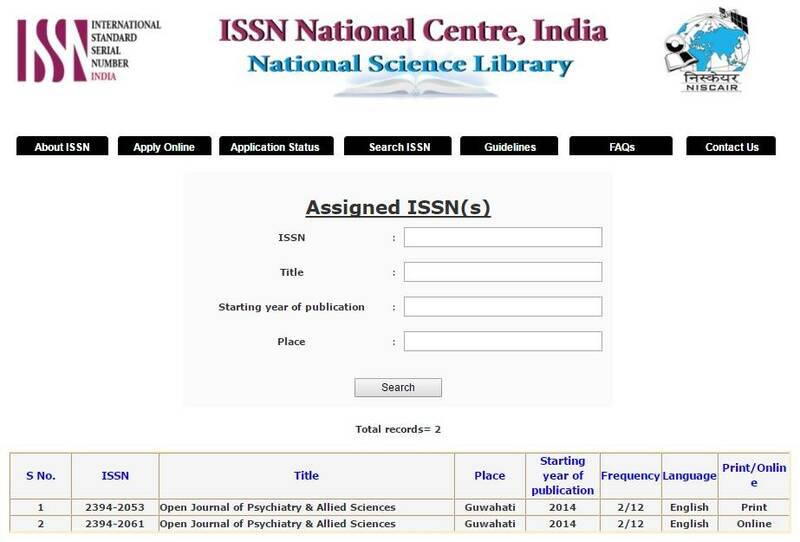 This service has been designed to ensure the earliest possible circulation of research papers immediately after acceptance. This is the first publication citable. After the release of the printed version, the paper can also be cited by issue and page numbers. Disclaimer: The statements, opinions, and data contained in this publication are solely those of the individual authors and contributors, and not of the publisher and the editor(s). The appearance of advertisements or/and product references in the publication is not a warranty, endorsement, or approval of the products or services advertised or of their effectiveness, quality, or safety. The publisher and the editor(s) disclaim responsibility for any injury to persons or property resulting from any ideas, methods, instructions, or products referred to in the content or advertisements. Manuscripts submitted to OJPAS® are evaluated entirely on the basis of their scientific content. There are no publication charges. All possible measures are taken to uphold the highest standards of publication ethics and to prevent malpractices. Authors who submit papers to OJPAS® attest that their work is original and unpublished and is not under consideration for publication elsewhere. In addition, authors confirm that their paper is their own original work, that has not been copied or plagiarised, in whole or in part, from other works and if the authors have used the works of others the same has been appropriately cited or quoted. The Editorial Team of OJPAS® is responsible for taking a decision as to which of the articles submitted to the journal are to be published. The Editors have complete discretion to reject/accept an article. The Editorial Team may confer/deliberate with other reviewers/editors in arriving at its decisions. The evaluation of manuscripts is made on the basis of their scholarly and intellectual content without having regard to the nature of the authors or the institution including gender, race, religious belief, ethnic origin, citizenship, or political philosophy of the authors. The journal follows a policy of fair play in its editorial evaluation. The editors are expected to exercise caution and ensure that they have no conflict of interest with respect to the articles they accept/reject. The editors and the editorial staff follow strict confidentiality and are required not to disclose any information about a submitted manuscript to anyone other than the corresponding author, reviewers and the publisher. Authors are encouraged to correct the errors which are found during the process of review while preserving the anonymity of the reviewers. Editorial decisions are based on peer review. The reviewers are expected to maintain absolute confidentiality with regard to the contents of manuscripts. The reviews are to be conducted objectively and the referees are expected to express their views clearly with supporting reasons. The reviewers should have no conflict of interest with the authors and the subject matter of the research. The reviewers are required to identify relevant published work that has not been cited by the authors. Any observation or argument which has been previously reported should also be accompanied along with the relevant citation. Similarities or overlaps between the manuscript under review and any other published paper of which the reviewer may have personal knowledge, may also be brought to the attention of the editors. The information or ideas obtained through peer review are of a privileged nature and must be kept confidential and not used for personal advantage. Reviewers should not consider manuscripts in which they have conflicts of interest resulting from competitive, collaborative or other relationship with any of authors or institutions connected to the papers. Authors are required to present an accurate account of the original research work and also an objective discussion of its significance. The paper should contain sufficient details of the literature and references. It is expected that all the authors have significantly contributed to the research. Fraudulent and knowingly made inaccurate statement constitutes unethical behaviour and would be unacceptable. Authors are required to ensure that the submitted work is original and has not been published elsewhere, and if the authors have used the work of others the same has been appropriately cited or quoted. Applicable copyright laws and conventions are required to be followed. Copyright materials should be reproduced only with permission and due acknowledgement. Authors are not expected to submit manuscripts describing essentially the same research in more than one journal. Submitting the same manuscript to more than one journal concurrently would constitute unethical practice and would be unacceptable. Proper acknowledgement of the work of others must always be made. Authorship should be limited to those who have made a significant contribution to the paper which is submitted for publication. All those who have made significant contributions should be listed as co-authors. Others who have participated in certain substantive aspects in the development of the paper should also be acknowledged. The corresponding author is required to ensure that all co-authors are included in the paper, and that the co-authors have seen and approved the final version of the paper and have agreed to its submission for publication. All sources of financial support should also be disclosed. Upon discovery of any significant error in the published work, it is the responsibility of the authors to promptly notify the editors and cooperate in the retraction or correction of the paper.